We will work together to further and advance the information and knowledge of our ancestors' histories while they resided in Bessarabia and the Dobrudscha. Village coordinators are Bessarabia RIG members who have expertise in researching specific villages. They're a great source of help for your research! We always welcome more volunteers to act as VCs and there is always room for more than one VC per village. Contact Lucy Simpson at lsimpson @wyoming.com if you are interested in becoming a VC. Projects undertaken related to Bessarabia will be coordinated within the framework of the GRHS Clearing House. If you're interested in volunteering to assist with a project, contact volunteer @grhs.org. The Bessarabia RIG web pages exist to assist those researching their family history in Bessarabia and Dobrudscha. Links or statements that are politically-oriented or may be objectionable to GRHS members will not be allowed. In order to maintain GRHS's status as a non-profit 501c(3) organization, links or statements related to commercial, for-profit endeavors are not allowed. 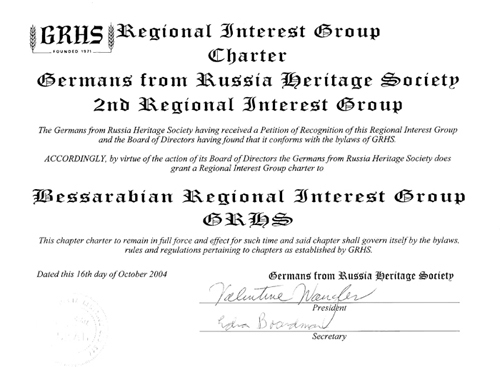 The Bessarabia RIG web pages have information that is freely available to anyone accessing this site, as well as information that is restricted to GRHS members. This data is available through a GRHS user id and password that is valid for that member as long as the member remains in good standing with GRHS. This newsletter was published from 1997-2008. All issues are online. An annual meeting of the Bessarabian RIG will be held, either at the GRHS annual convention or online. Election of officers will be held on line and paper ballots will be mailed to those members who do not use e-mail. An annual report will be presented by the RIG president/spokesperson to the Bessarabian RIG members present at the annual meeting and made available on-line for those members not attending the annual meeting.